Famed clothing designer and Florence resident Billy Reid is moving his flagship store and corporate headquarters to downtown Florence. 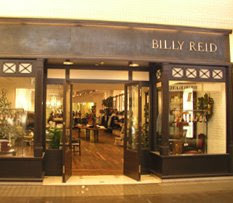 The Billy Reid clothing name is recognized worldwide and the company has retail stores in New York City, Dallas, Houston, Nashville, Tenn., and Charleston, S.C.
Beginning in late May, company business will be conducted from 114 N. Court St. in Florence, in the building that housed Anderson's Bookland for decades. Renovations have already started. When completed, the building will showcase the entire Billy Reid men's and women's collections, which were previously shown in full only at the New York store. Reid's design studio will be placed upstairs, where he will also set up an area to fit customers for his signature hand-tailored, made-to-measure clothing. The corporate offices will also be housed upstairs in the store, with about two-thirds of the bottom floor being dedicated to distribution, according to Reid. The corporate and warehouse operations are now being conducted in Dallas. The other third of the downstairs portion of the store will be used for the retail operation. Reid said business in the Shoals has been good since he moved to the area, plus he added that many out-of-town customers shop at the local store. Reid said Monday that 10 people will be involved in the Florence operation when it opens in late May. He said others will likely be added when the economy rebounds and business returns to normal levels. "The Bookland building is really a great building with a lot of character and history," Reid said. "There are some beautiful architectural details in the building, a lot of which had been covered up during moderation efforts. It is our intention to restore it to its original glory by exposing its incredible details and raw charm." Reid said he and his staff had been contemplating for months the possibility of moving all operations under one roof. He said it made sense to move them to Florence where he lives, and the Anderson's Bookland building made perfect sense. Billy Reid's local operation has been in the Pickett Place residence in Florence since spring 2004. "Pickett Place has been a wonderful home for our shop and my studio over the past four years and we have fond memories of our time here," Reid said. "As our business grows, we felt the need to bring all our company's functions and key people to Florence. This move will certainly make us more efficient. "Our goal all along was to build the company globally from right here in the Shoals, and this is a big step toward those objectives." New York magazine recently cited Billy Reid as the best men's store in New York City. In 2001, Reid won the Council of Fashion Designers of America's Perry Ellis Award after he released the William Reid collection. His clothing has also earned recognition from media outlets such as GQ, Details, Elle, men.style.com, Vogue and others. In addition to being available in the Billy Reid stores, the high-scale clothing and accessories are available at billyreid.com. Reid said online sales continue to be strong.